Well, I’ve got a new theme up (Sugar & Spice) and retired the old one (Twenty Twelve). One of my pet peeves is having comments appear on different pages. I want them to just show up for posts. I think I’ve messed it up and gotten comments removed forever. This post is a test. Update: I’ve managed to add date & comments under the titles of blog posts but unfortunately still have the comments showing up for the pages. If anyone knows how to fix this, please let me know. I decided to brighten up the blog by adding a header. Yes, it’s only a dash of pink and purple but I like the overall effect. I took the photo a few months ago, from the roof of a building. The weather was clear and I loved the view. I was going to use the image for a book cover but it didn’t work out so I manipulated the colors until I turned Kuwait pink. 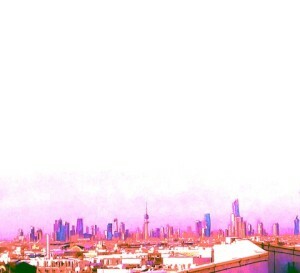 I like this new skyline of Kuwait. A few years ago we had a handful of tall buildings in Kuwait. All that has changed now. The Communications Tower is in the center of the photo. You can see how Al Hamra Tower dwarfs it to the right. All these new skyscrapers and buildings are changing the city’s skyline. They change my perception of neighborhoods when I drive into them. There are so many places for new towers to be built. I’m sure the next few years will change the skyline even more. I'm Nadia! I enjoy creating new worlds and sharing them with readers. I write mainly fantasy (paranormal/urban/epic) but enjoy reading all genres. Join my monthly newsletter to receive exclusive updates and free short stories. So Many New Books! So Little Time! Nadia has read 41 books toward her goal of 100 books. Share book reviews and ratings with Nadia, and even join a book club on Goodreads.